Chemotherapy involves a drug or combination of drugs given to stop or slow the growth of cancer cells. Chemotherapy is most often given by vein using an intravenous (IV) infusion. Some chemotherapy can be taken by mouth in a pill form. Before you begin treatment, you will be scheduled to attend a New Patient Chemotherapy Class. In this session, you will learn about what to expect during chemotherapy, how to manage possible side effects, and how to look after yourself during chemotherapy. You will also have the opportunity to ask questions. You will be given a “Learning about chemotherapy for patients and families book” to take home with you. The nurse will also give you information about the chemotherapy drugs that your doctor ordered for you on your first visit in the Chemotherapy Suite. Please bring one family member or friend with you to the New Patient Chemotherapy Class. When you come to your appointment, please bring your valid health card and any medication that you might need during your stay, including pain medication or pills to prevent you from being sick. 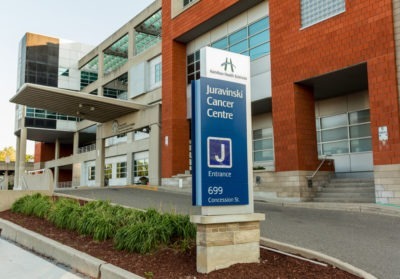 When you arrive for your chemotherapy treatment on the second floor of the Juravinski Cancer Centre, register at the Reception Desk. You will be given an identification armband and be asked to take a seat. A pharmacist may speak with you to review your medications. You will take your own pills to stop you from being sick. For safety reasons, we ask that you bring only one family member or friend with you into the treatment area. We do not allow children under the age of 16 into the treatment area. Intravenous chemotherapy is given in a vein in the arm or in a special kind of intravenous catheter called a PICC or a PORT. Treatment is different for everyone so your chemotherapy may take minutes or up to several hours to give. Once your treatment is finished, you will schedule your next appointment time at the Reception Desk.